Six Million Cariocas (term used to describe inhabitants of Rio) live in a coastal territory of 1 171 sq km. The Northeast and Southeast areas are the most populated areas in the city, holding close to 80% of the population! As other large urban centers in Latin America, Rio de Janeiro is characterized by strong social stratification, which is physically manifested by the topography of the city. 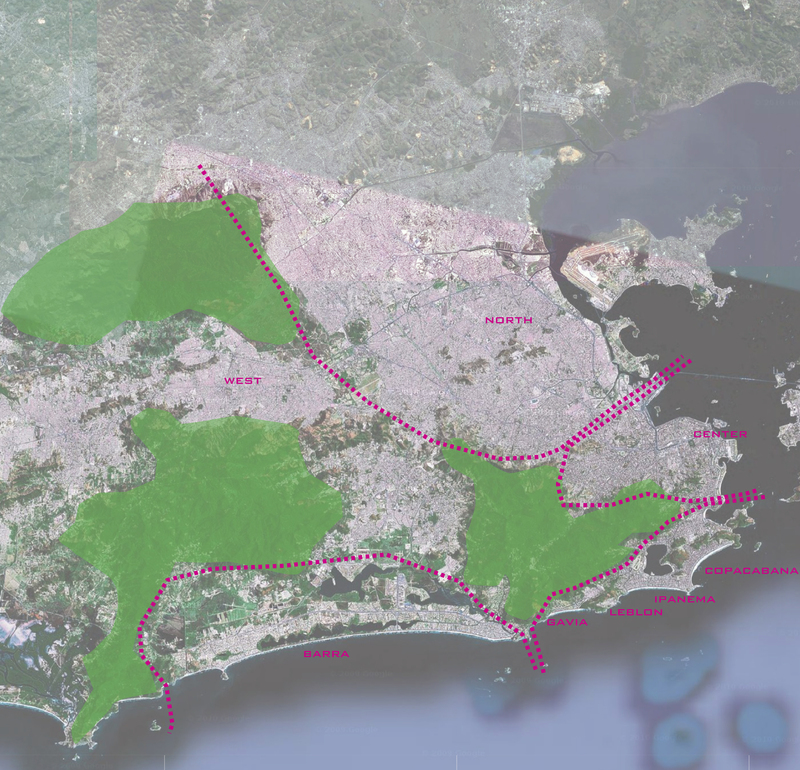 As a simple diagram, the landscape divides the city the following zones. 1- The South: A residential area reserved for the wealthier population of Rio. Conforming this area is long ribbon of buildings constructed in between and the mountains and the beach/water, and establishing the axis of Copacabana, Ipanema and Leblon. This area counts with better infrastructure, services and mobility systems. 2- The Center: Almost a mandatory passage between the North and South, the city center is home to embassies, commerce, public administration. As such, it contains a large economic and political power. 3- The North: The North can be considered a large suburb of the city. This zone is characterized by the industrial development, the Federal University, the airport…The area still holds a large number of proletariat housing and is residence to the middle to lower classes in the city. Moreover, due to the proximity with factories and other employment opportunities, large favelas (“complexos de favelas”) established themselves in the area. 4- Barra: Developed by Lucio Costa, this area is one of the most recently developed areas in Rio. To be honest, it can pretty much be described as a large, and quite vertical, commercial and suburban sprawl, containing highways, luxury residential buildings and shopping centers. The car dependence and fragmentation of the urban fabric is high and needless to say, most places here are privatized and exclusive. 5- The West: Having available space, this rural zone has recently began to be urbanized. “Developers” parcel the land and sell them at lower prices to newcomers. Nevertheless, they (the “developers”) don’t urbanize the areas, leaving streets unpaved, unfinished infrastructure for drainage and other basic services, etc. That said, residents in this area have land titles (even if they are “informal” or fraudulent), they have a more regular development than that of an informal settlement, yet still lacks the same services (water, drainage, sewage) of residents in a favela. Today, the Western zone comprises about ¾ of the municipal territory and is home around 1.5 million inhabitants. The morros: The geography of Rio is such that the morros, or hills, are located all around the city. 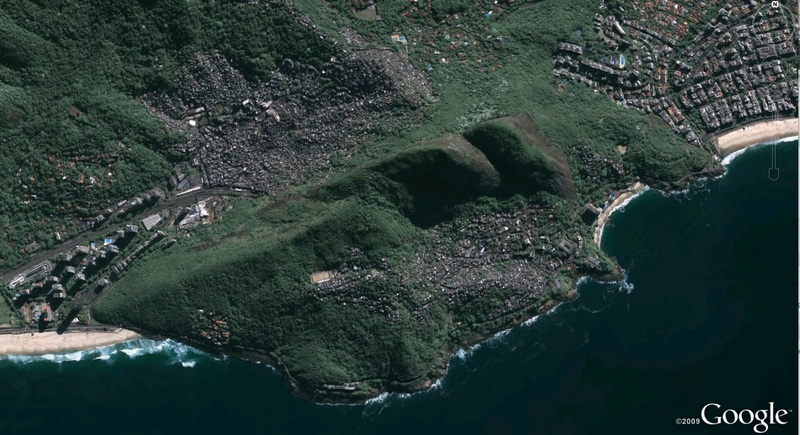 This is the area where the majority of the favelas are located. Contrary to the general belief, that real estate increase with a certain altitude (and views), these areas were left, for a long time, undeveloped, allowing a large number of favelas to establish and grow in them. 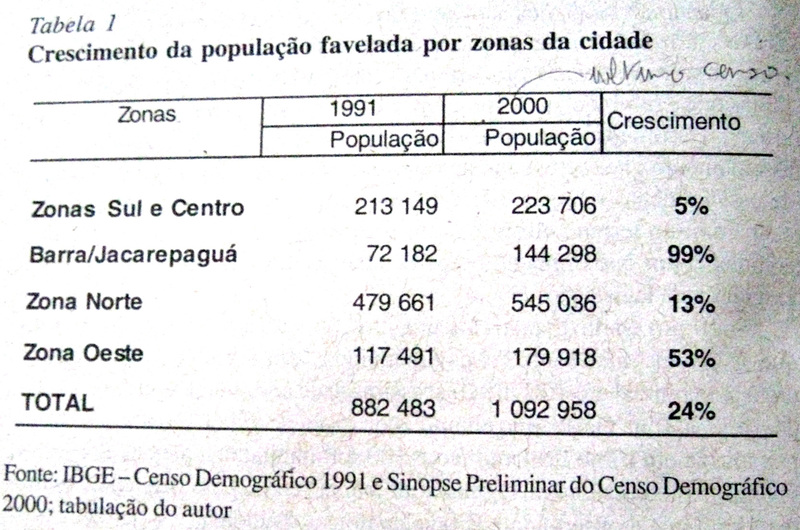 Favela Population Growth (by city zones)- chart taken from F. Cavallieri's article: "Favela Biarro: Integracao de Areas Informaes no Rio de Janeiro"
It is important to note that Rio is also a city that is environmentally fragile. There are three large mountains with many water springs that flow down the slopes towards the very densely urbanized plains. As Rio is characterized by a strong summers and very strong rains/storms, the possibilities of inundations are quite large in many parts of the city (you just have to open the newspaper today to see the damage the floods and land slides are causing the city)!